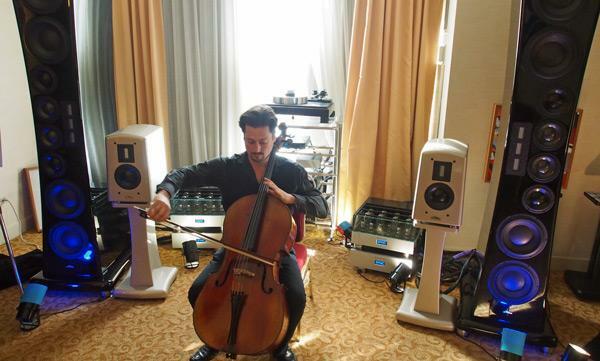 Before I conclude our coverage of last weekend’s New York Audio Show, let me say that it was a pleasant surprise to find the Marriott’s corridors still busy before the show ended 5pm Sunday. While the show had a smaller number of exhibitors than I would have wished, the venue was excellent and the show was definitely a success and those manufacturers, distributors, and dealers who exhibited all had excellent traffic. Well done, Chester Group. 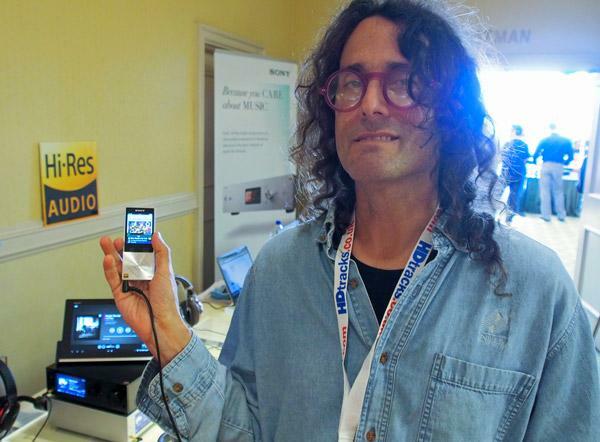 Sony's hot news at the New York show was the launch of what they called a "Walkman." However, this was no cassette player like the Walkpersons of 30 years ago but a hirez-capable file player with 64GB of RAM and a micro-SD slot for memory expansion. Priced at just $299 and beautifully styled, as you can see from the photo with David Chesky modeling it, the new Walkman makes my Astell&Kern player look clunky. But peculiarly, the new Sony player doesn't handle DSD files, just PCM up to 192kHz. Billed as “Michael Fremer’s Ultimate Turntable Set-up Demo,” the final seminar at the Brooklyn show once again revealed that the editor of AnalogPlanet.com and Stereophile columnist has, as you might say, “large attachments.” I find setting up a phono cartridge the most stressful of audio-related activities, and that’s in the quiet of my home, with no pressure and all the time in the world. By contrast, Michael does it in public, with the clock ticking, an audience watching, and a high-definition video system showing a close-up of every move on the screen above and behind him. Reliable readers of show reports will remember Robert Lighton as a successful designer and manufacturer of furniture who, a few years ago, turned his enthusiasm for domestic audio in general and Audio Note gear in particular into a side career by putting his own imprint on the basic Audio Note loudspeaker formula. 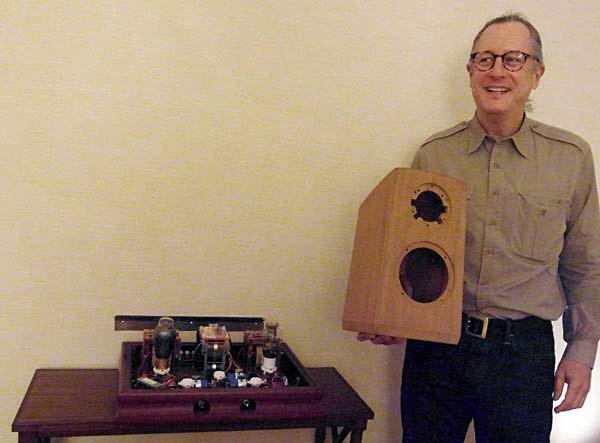 Robert Lighton Audio of New York City has now progressed to designing and manufacturing its own high-efficiency loudspeakers, including the two-way RL5 ($10,000/pair)the solid sapele mahogany enclosure of which is seen here in Robert's hands. . .
Saturday dawned hot and brightunnaturally so for the end of Septemberand showgoers showed up well before the 10:00am starting time: So much for my hopes of getting a jump on the crowds. 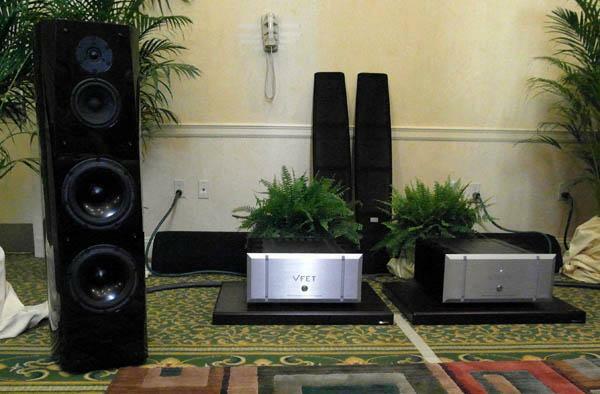 Still I went for an early listen at the room shared by Volti Audio, Raven Audio, and Triode Wire Labs. 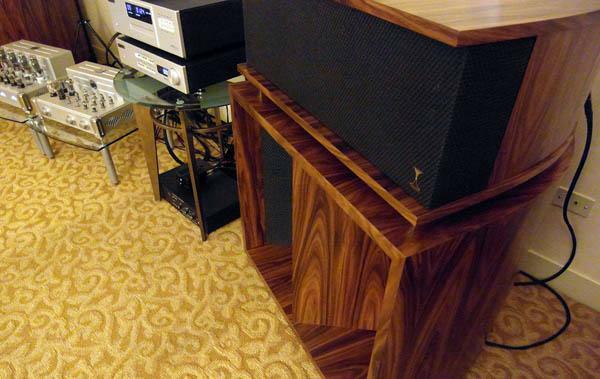 The price of the three-way, fully-horn-loaded Volti Vittora loudspeaker ($21,500/pair without optional ELF subwoofer) has risen slightly since I wrote about it a year or so agoyet it still endures as perhaps the best bargain in US-made hi-fi. The Brooklyn show offered a full program of seminars throughout the weekend, and one of the best-attended was "The Virtues of Vintage," which took place late Saturday afternoon. 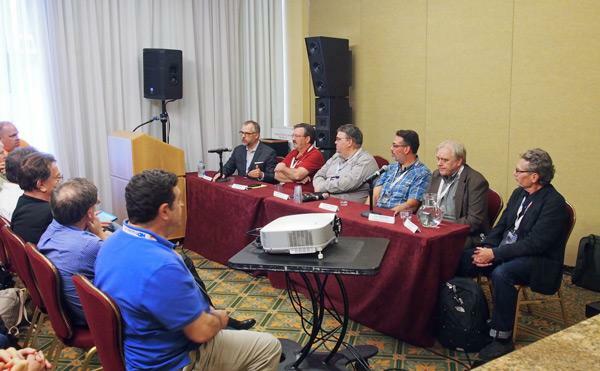 Chaired by Stereophile's Art Dudley (far left), a panel of expert anachrophiles comprising (LR) Steve Rowell (Audio Classics), Mike Trei (Sound & Vision), Jonathan Halpern (Tone Imports), Joe Roberts (Silbatone and once Sound Practices) and Herb Reichert (Stereophile) started off by examining what great components from audio's past had to offer. 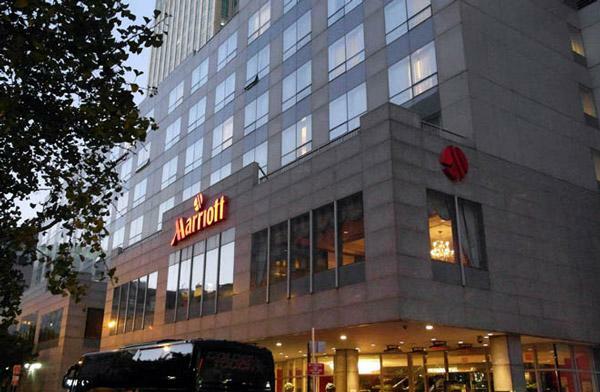 The Marriott Brooklyn Bridgesite of this year's edition of Chester Group's New York Audio Showturned out to be a short, pleasant walk from the Jay Street station. Show registration was just around the corner from the Marriott's main desk, and the show continues through tomorrow (Sunday). It may be just a subway ride away from the biggest Apple, but to some inveterate Manhattanites, an audio show in Brooklyn sounds like it's from another planet. 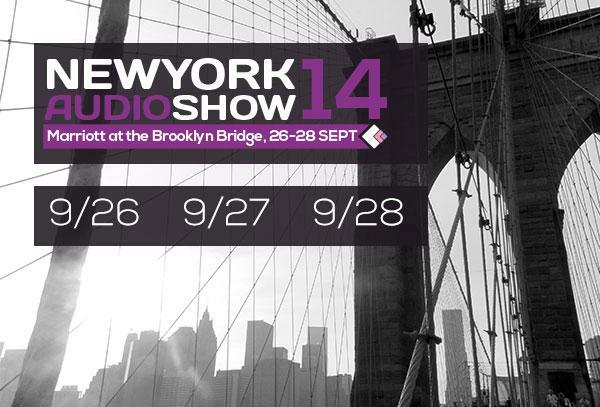 In reality, the third New York Audio Show, which opens to the public on Friday, September 26 at 2pm and continues through Sunday, September 28 at 5pm, takes place at the Marriott at the Brooklyn Bridge, just a short distance across the East River from Manhattan.